We've partnered with finest credit card processing companies. This includes online donations, tickets to events, merchandise (i.e. memberships, mugs, t-shirts, books, etc.). Best of all, with our merchants you'll see far more transaction details automatically go directly into your Trail Blazer database than if you went with someone else. Don't worry if you're new to this process. We're here to help you figure out which merchant would suit your situation best. Simply call us at 1-800-446-1375 for help. Increase revenue by choosing recurring donations from Authorize.net or Vanco. Donors enter payment information once to set up an entire series of recurring transactions. Raise money on your Facebook page using our donation form which is linked to your Trail Blazer database. Your data is secure in our PCI Compliant network. Trail Blazer achieved its PCI certification in 2014. We are committed to safeguarding your data and we promise to remain vigilant in monitoring our PCI compliance. We know that fundraising events play a critical role in your organization's success. That's why we include at no cost our cutting-edge event and online donation tools. Free website integration is included with your Trail Blazer purchase. This means you'll easily track how many tickets have sold and plan accordingly. Plus, you can sell merchandise (i.e. mugs, t-shirts, etc.) easily using our free web tools. Every time a donor makes an online donation, you can rest easy that all of the transaction data will be there for your detailed compliance reports. 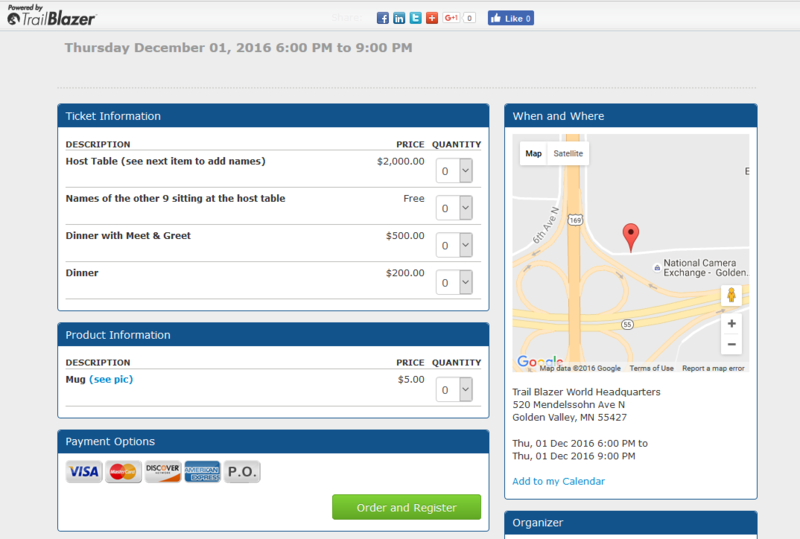 Trail Blazer's fundraising software harvests all of the activity from your web page. Whether you're a political or nonprofit organization or a PAC, your online donations are tracked and logged using our web forms. We've hand picked the best gateways in the payment industry. Below are details and quick links to their applications. Founded in 1996, Authorize.Net provides payment solutions for small- to medium-sized organizations. Cybersource is compliant with the Payment Card Industry Data Security Standard ("PCI DSS") as a Level 1 PCI Compliant Service Provider. Founded in December 1998, PayPal is the leading global online payment company. PayPal provides service to over 113 million active registered accounts and is available in 190 markets. Trusted by millions of retailers -- fast, easy and secure. Add PayPal to boost sales by tapping into over 100 million active online buyers. Serving oganizations based in the U.S., Canada and the U.K.
Vanco Payment Solutions provides online giving services to more than 15,000 churches, schools, nonprofit organizations and political campaigns. Anedot is your quickest merchant option. Start accepting donations in just minutes, not days. To compare your four gateway options, we've created a handy cost calculator. To get started, all you do is click on the image or link shown. From there, you'll enter your average donation amount and the average number of donations each month. Run as many scenarios as you want. You'll easily estimate which vendor fits your particular situation best. * Recurring donations are supported by Authorize.net and Vanco Payment Solutions.